“Your love is unique. Your ring can be too. Why is custom jewellery design the popular choice for buying an engagement ring, or even treating yourself to a pair of earrings or any jewellery gift? Gone are the days of limited options. You can have the design of your dreams made to your exact taste, it will cost you less than an off-the-shelf design from a regular retail store, and it can be delivered to your door. Does custom jewellery design sound expensive and complicated? You’ll be pleasantly surprised. 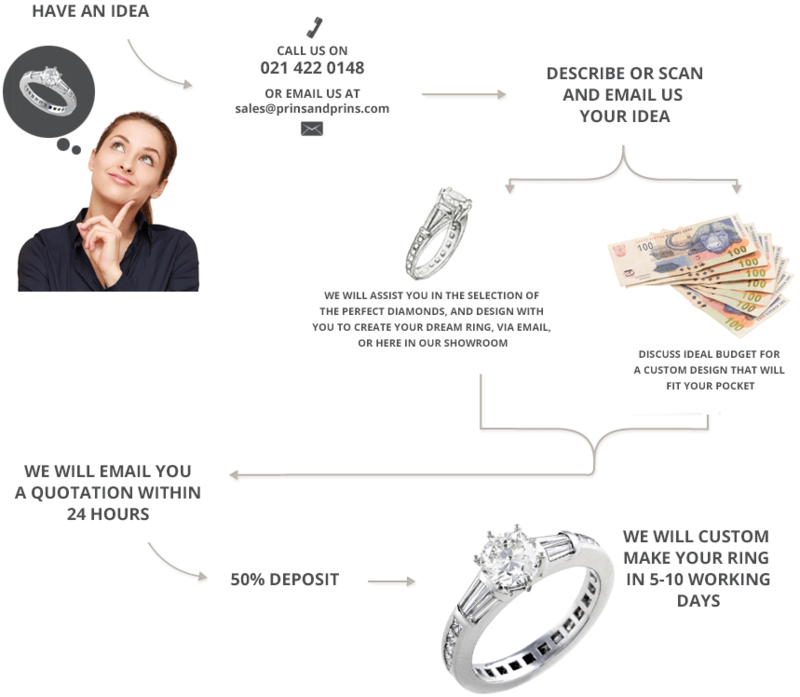 Custom jewellery design at Prins and Prins will literally make your dream ring come true, for less. Bring your diamond ring ideas to our talented team of jewellery designers and goldsmiths. We can offer design advice, sketch your design for you, create something new and unique, work within a budget and recommend the perfect diamond, or other gemstones. We can work via email, and answer all your questions. "I just want to say thank you very much for your great help and also good explanation on your diamonds when I visited Prins &Prins. I am really happy with the diamond ring I have chosen and my wife likes her new diamond ring also very much. Thank you again and I am sure I will visit Prins & Prins again on my next trip to Cape Town."